Rich and creamy cheesecake, sweet and gooey caramel, and toasty pecan come together for a one of a kind dessert experience. 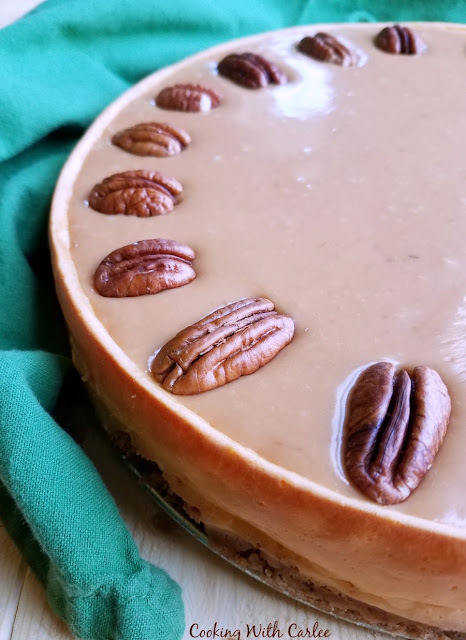 Perfect for dinner parties, birthday parties or a great addition to your Thanksgiving dessert table! Isn't it a great day for a party? Come on in and make yourself at home. Grab yourself a drink and get ready to have a good time. It is Angie from Big Bear's Wife's virtual baby shower today and it's a surprise so shhhhh! She'll be here any minute. I was so excited when she announced she was pregnant on her blog! I've been reading along for almost as long as I've been immersed in this food filled corner of the internet. Her delicious looking recipes draw me in every time. She has been very open with their want to have children and how it just wasn't happening. Then out of nowhere they got a happy surprise! So I couldn't wait to be a part of the celebration! If I had to make a list of things I really enjoy doing, throwing parties and making sweets would come near the top. Of course in my frosting filled world it's not a party without sweets, so they go together anyway! I did toss around the idea of making a snack mix or appetizer for the party, but after a few minutes of brainstorming on that idea my phone beeped. If you spend a minute or two purusing Angie's site, you'll see that Southern food is one of her specialties and decadence is not something she shies away from. So a cheesecake with rich caramel baked into it and spread over it seemed like something she'd enjoy. Add that southern nod with the pecans and I instantly knew it was perfect. Of course I made some minor adjustments as I went to fit the ingredients I had and because I can't help but to tinker. But largely this is the same recipe Kathy passed along 4 years ago that just so happened to reappear at just the right time. I served it up as one of the options at our annual shrimp boil and it was a hit. The rich sweet caramel is the perfect cushion for the not overly sweet cheesecake. The cheesecake itself is made basically the same way as our favorite cheesecake recipe from my Aunt Donna. It comes out great every time, so I knew I wouldn't have to worry about cracks. The pecans were the perfect garnish for the top. My nut adverse husband quickly noticed them but was glad that it would be easy enough to pick off. I neglected to mention there were pecans in the caramel layer by the crust as well. I had purposely chopped them really fine hoping he wouldn't notice. So now that we've had a sneak peek at dessert, I can't wait to see the other goodies. What are you're favorite recipes to whip up for a shower? In the bottom of a 9" springform pan, mix together the graham cracker crumbs and brown sugar. Stir in the butter and press down to form a crust. Melt about half of the caramels and half of a can of sweetened condensed milk until it is smooth and creamy. Pour caramel over graham cracker crust and sprinkle with chopped pecans. Bake for 15 minutes, then set aside. In your mixer, beat cream cheese until it is smooth and creamy. Add the second can of sweetened condensed milk and beat until incorporated. Add the eggs, one at a time, mixing until full combined after each. Don't over mix at this point, you don't want to whip too much air into the mix. Stir in the vanilla and pour cheesecake over prepared crust. Bake for about an hour or until the middle is just set. Cool at room temperature for about an hour and then chill completely. Before serving, melt together the remaining caramels and sweetened condensed milk until creamy. Pat the top of the cheesecake dry if there is any condensation, then spread melted caramel over the cheesecake. Garnish with whole pecans. Store cheesecake and any leftover in the refrigerator. Please take some time to check out all the amazing recipes we made for Angie's virtual baby shower! Pimento Cheese Stuffed Buttermilk Biscuits from It's Yummi. 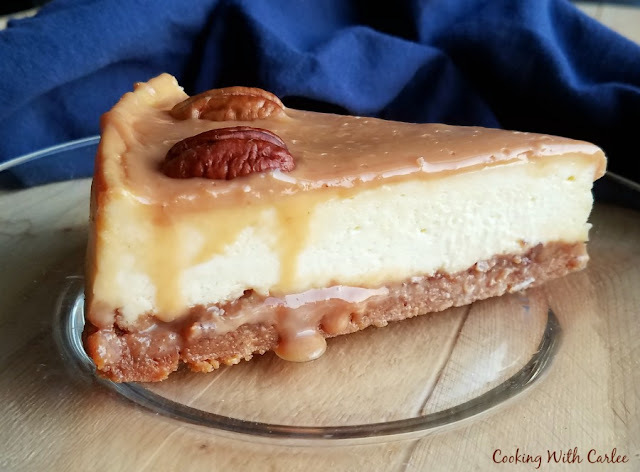 Caramel, pecans and cheesecake all on one..I'm in heaven..if this gets in my mouth and it shall because I MUST make this!! Our youngest loves any kind of cheesecake so he and mama can eat it all!! Happy weekend!! You should totally make this then, maybe a belated birthday treat! I'm so glad that Kathy passed this recipe along to us and you got it at just the right time! And congratulations to Big Bear and his wife! What a special blessing babies are. So happy for them. It was perfect timing, that is for sure! 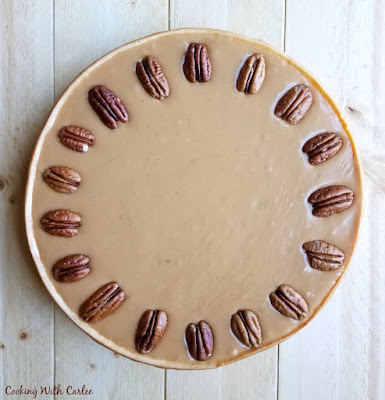 Thank you for the Virtual piece of caramel pecan cheesecake. It was virtually delicious! Seriously, this cheesecake looks so good. That nice thick frosting is the kicker! You are welcome, any time! This cheesecake looks perfect! And I love the idea of making it for Thanksgiving or even Christmas! Wouldn't it be a fun addition to the holiday dessert table? Thanks, Val! Thank you! It really is quite simple to make but a showstopper none the less! This looks so heavenly Carlee!! You can't go wrong with condensed milk or caramel! And this cheesecake uses both! Definitely worth indulging :). I am sure Angie loved it! Thank you! It definitely has a lot going for it, so you know it has to be good. This looks amazing! 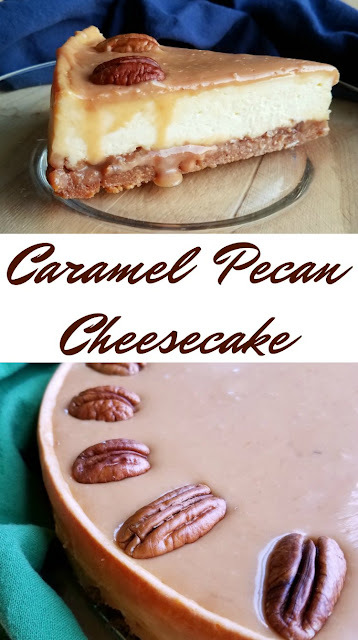 My husband loves cheesecake more than any other food, but he also would give back the pecan, lol! Too funny and imagine that! Those husbands of ours are silly. Ahhhh it's the perfect cheesecake! Thomas and I love cheesecake! Thank you so much for being a party of my virtual baby shower to celebrate Baby Jackson!!! Yay! I am so glad you like it. Congratulations to you and Thomas! Hopefully you are catching some sleep when you are able and loving on that cute little man! I'm a sucker for cheesecake and this one looks so amazing! Pinned it! I am too! This one is a must make if I do say so myself! Thank you! Mmm, pecans are my fave... Looks fantastic! I will have my hubby making this soon! This scrumptious looking dessert is my Featured pick for the new Merry Monday party starting tomorrow night. Congrats to Angie!